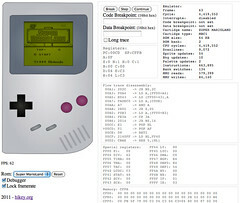 – Can run Super Mario Land and Tetris (and not much else). – Full speed (60fps) in Chrome 9. – Menu to switch cartridges. – Code and data breakpoints. – Program flow trace with disassembler. – Runs super-slow on iPhone. – Comes as a single HTML file, data is embedded.